Our delicious squid tubes are made of the Todarodes pacificus. This squid is also known as the Japanese flying squid, the Japanese common squid or the Pacific flying squid. As the name already suggests the Todarodes pacificus lives in the Pacific Ocean, which is also known as FAO fishing area 67. It can also be found along the entire coast of China up to Russia, across the Bering Strait and in the area surrounding Japan. Since the Japanese flying squid is caught quite far away from the Netherlands we have to import our squid from China. However, we can ensure you that our imported squid will be fresh and of a high quality. As a supplier we sell our squid tubes cleaned, wings off and tip on. Thereby we also have squid rings and battered squid rings available. We batter the squid rings ourselves in our own company in the Netherlands. We also have whole squid available, which is made of the Loligo vulgaris, at our ‘North Sea Fish’-page. Squid tubes or rings have a light seafood taste and are slightly chewy. You should not cook it too long since squid can taste rubbery if you do. One hundred grams of squid rings or tube contain around 85 calories when they are raw. However, they contain a lot more calories if they are battered or breaded of course. Squid tubes or rings also contain some vitamins, including various B vitamins. They are also a good source of protein, which are necessary for good functioning, the structure of all living cells and growth and repair. Squid tubes and squid rings are popular in many parts of the world. Squid rings are for example used in paellas and you can also buy the rings at various fish stalls. In English countries fried squid rings are often called ‘calamari’, which is the Italian word for ‘squid’. Calamari is often served with lemons and marinara sauce and it is topped with Parmesan cheese. 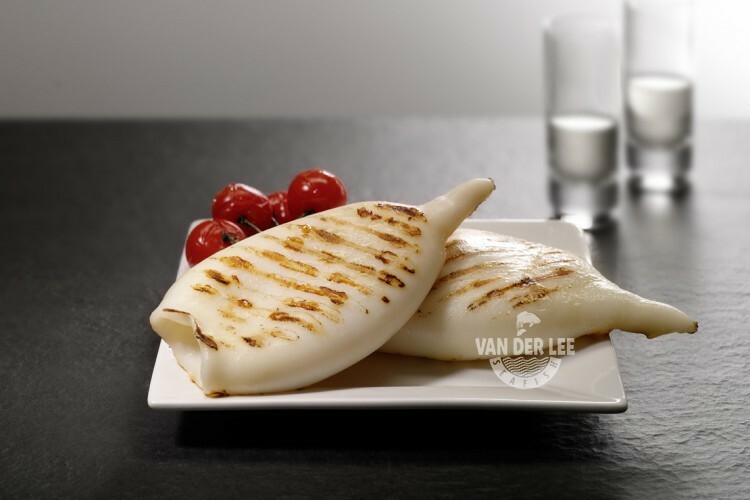 Squid tubes are also delicious when they are grilled and served with a little salad, lemon, lime and cracked pepper. If you want to add some heat to your squid tubes you can also try slicing some chilli peppers and place them inside the squid tubes. Another way to eat squid tubes is to stuff them. You can stuff the tubes with crab, shrimp, sausages (such as chorizo) and even with rice, which is also known as ‘Ikameshi’.